Located on the southwest coast of India, Goa is a state that has a million and a half inhabitants. 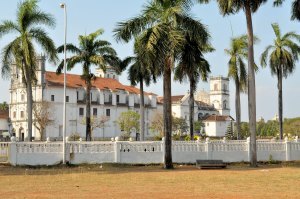 Former Portuguese colony, Goa has a tropical climate, with a permanent hot season, and high humidity, the monsoon season is between June and September. The best time to get there is from December to January, with temperatures between 20 and 30 ° C. Tourism is a very important part of the economy of Goa and its beaches are very popular with travelers from around the world. However, they are not the only attraction of Goa: you will discover the Portuguese districts of Panjim, you will stroll through the streets of the capital, you can admire the beautiful colonial houses of Quepem or Chandor, you can admire the magnificent cathedrals, you can climb to the chapel of Old Goa to enjoy the view of the surrounding panorama. Another way to explore the place: rent a bicycle or scooter and drive through rice paddies and palm groves, or go bird watching and countless butterflies in the forest. Evenings can be just as enjoyable as the days, with sublime sunsets or festive meals in small restaurants of the Portuguese district cited. If you find there in March, the Goa Carnival is an event not to be missed. Goa can be accessed by air, and there is no problem to find an accommodation in a variety of price ranges: you can even get a bungalow on the beach, for a small fee, and the restaurants do are never far away! A heavenly stay you will not soon forget.